Road Litter's Blog - watch them grow up! 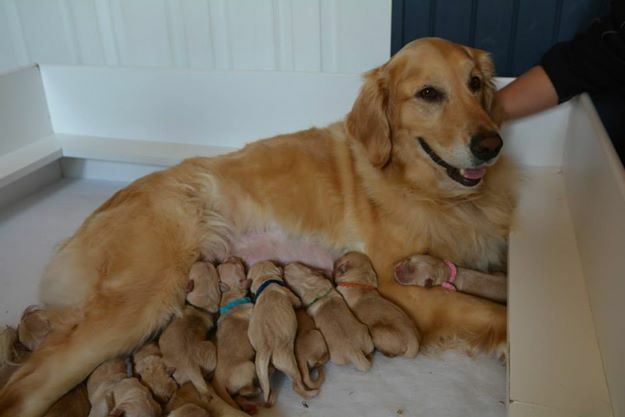 Bon whelped her first litter, twelve ! pups, on September 21, 2014. You can see photos and videos of these pups on their blog. We chose "Road" as the theme for the litter with all registered names containing the word "road" or a type of road. SHR Audeo's Road Not Taken CDX PCD CD-C BN OAJ NA NF JH WC CCA CGCA TKN. Mr. Brown, now known as Journey, has moved to Long Island with Karen and Norman Goldberg where he'll be doing obedience, agility, and maybe field. Audeo's Toll Road JH WC. Mr. Wine, now known as Token, has moved to Connecticut with Chris Marinelli where he'll be doing agility, field and obedience. Audeo's Roadrunner RE CDX OA AXJ OF TKA VCD1 TD JH WCX CCA VCX Can TD WCI JH. 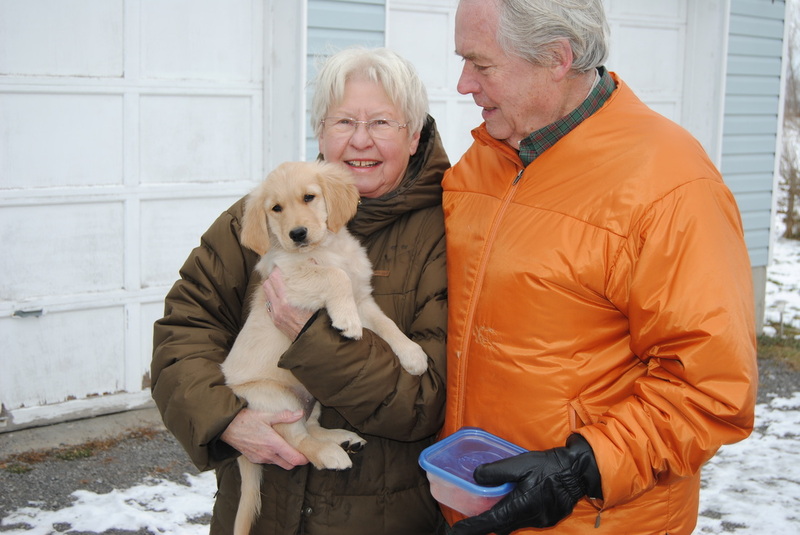 Mr. Teal, now known as Beep!, headed to New York with Sue Reuss where he'll be doing just about everything - agility, obedience, tracking, and maybe some field work. CH Audeo's Life Is A Highway JH WCX . Mr. Orange, now Arvy, is off to Manitoba with Judy and Hugh Andrew. 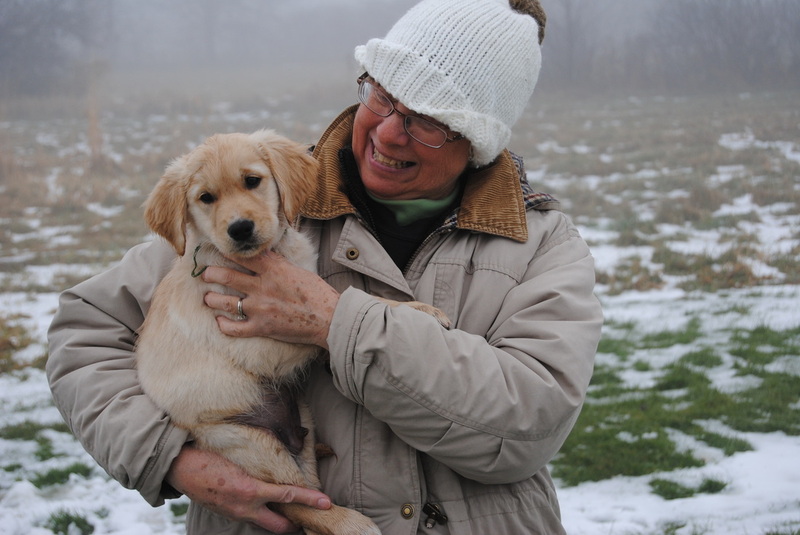 Arvy will be doing lots of obedience and field work with Judy, and will be hitting the show ring one day. UKC-CD Audeo's Off Road Adventure CD JH WCX CGC . Mr. Dark Blue, now Blaze, headed south to Maryland, and now Colorado. 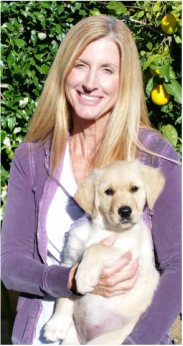 Blaze will be doing lots of field and obedience with his new mom, Sharon Albright. ​Audeo Topmast King Of The Road BN CDX RE OA MXJ OF TKN CGC . 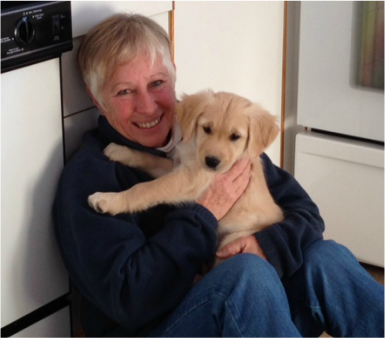 Mr. Green, now Dean, has also headed to Long Island to have lots of fun in obedience, agility, tracking and field with Barbara and Anthony Verga. Audeo's Long And Winding Road. Mr. 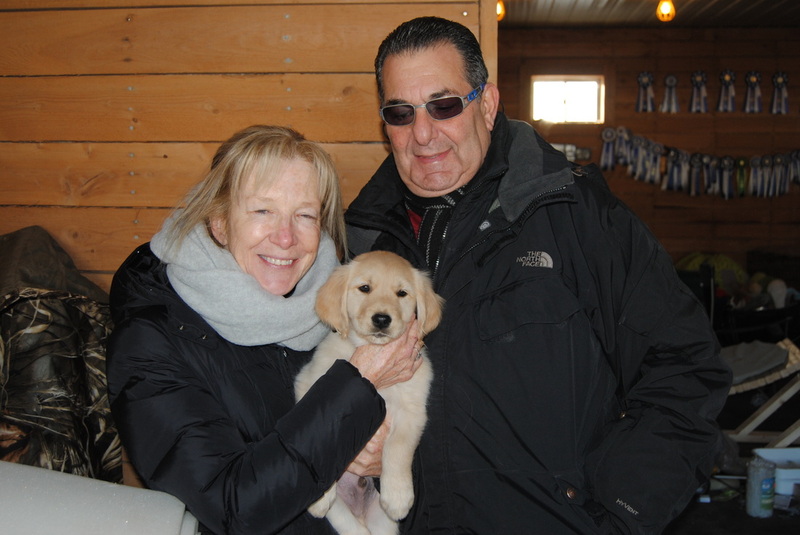 Bright Blue, now Tucker, joins his Aunt Luci and his owner, Fred Cuda and the Cuda family, in Massachusetts. Tucker will be getting lots of birds in his future when he joins Fred hunting. ​Audeo's Road To Razzmatazz Am/Can CDX. 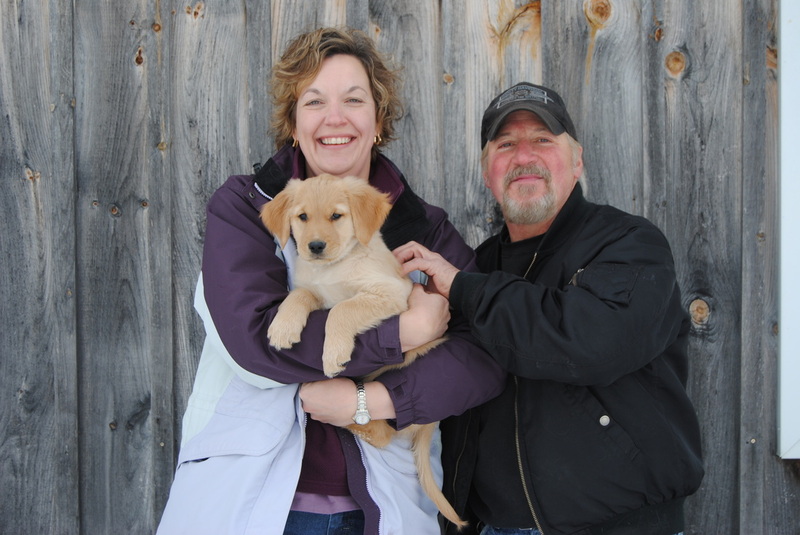 Ms. Raspberry, now Razzle, is off to do obedience, and maybe some field, with her new mom, Louise Bastien, in Quebec. CH. Audeo's One For The Road CD. Miss Pink, now Cheers, headed west to British Columbia with Deb Girvin to do obedience, conformation, and maybe some field work. Audeo Topmast Road to Ritzy RE UD SH NAJ WC CGC. Ms. Lavender, now Ritzy, is now a California girl. 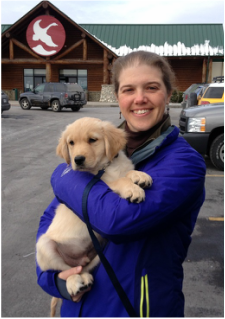 She will be doing obedience, field and tracking with Kim Portney. Audeo's Travellin' Roadshow CD RA WCI AG.N PCD SDDA. 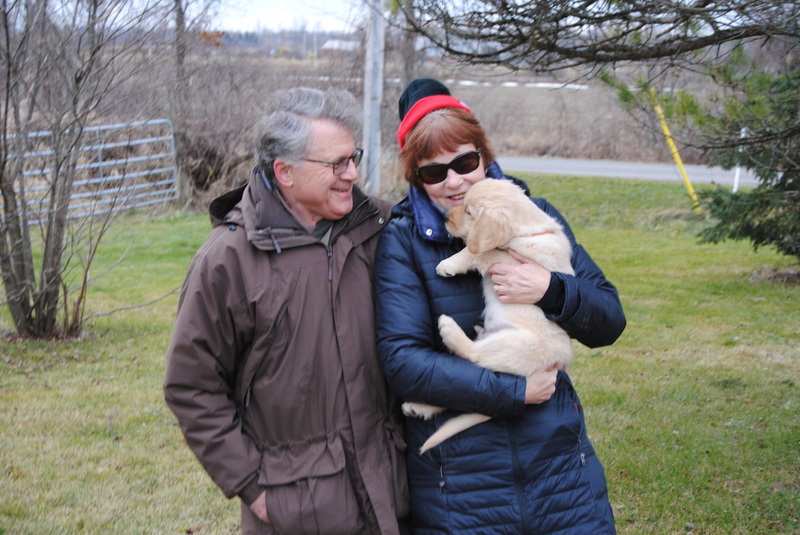 Ms. Red, now known as Follie, is staying close by with her new owners, Ginny and Warren Chafe. Ginny and Follie will be doing lots of obedience, field, agility, nosework and tracking. ARCH Audeo's Road Less Travelled RE CD DJ NW3 NW3-E NW3-I RL3 RATI. Ms.Mocha, know known as Lila, is off to Pennsylvania with Stephanie Day. They'll be doing obedience, agility and who knows what else! 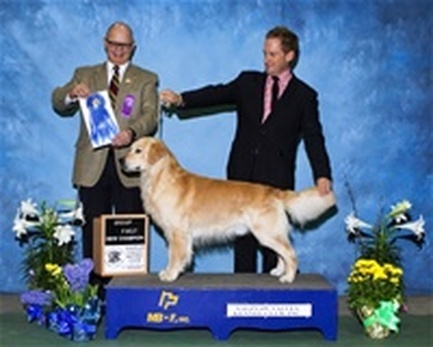 The pedigree is an exciting blend of field and performance competitors and top producers of performance and show Goldens from both North America and England. It brings together two very talented young performance dogs who are at the prime of their working careers and for whom the best is yet to come! We expect that this pairing will produce healthy, good-looking, fast, focused, biddable puppies, willing and eager to do whatever their owners decide to do with them…but they will need a job! Both Bonny and Manny have OFA Good Hip Clearances, OFA Normal Elbows, Current clear CERF Eye exams (within 12 months), OFA Heart clearances by a Board Certified Cardiologist, and normal thyroid function. Bon is PRA/prcd and PRA-1 clear and an ICT carrier. Manny is clear for PRA/prcd, PRA-1, and ICT. What these DNA tests mean is that no puppy from this pairing will be affected for the three diseases. Both Bon and Manny are healthy dogs with no health problems such as skin or ear problems. There is very good longevity behind both Bonny & Manny. 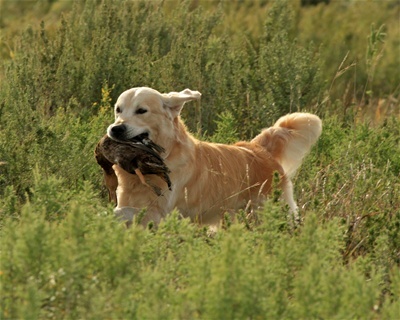 Manny is the 5th CH MH** Golden Retriever in GRCA history and is a wonderful example of everything a Golden Retriever should be - a talented hunting dog with classic good looks, type, and intelligence combined with a perfect Golden temperament. Manny is a gorgeous boy and quickly earned his AKC Championship with FIVE Majors, a BOB, and a Group 1st. He is well muscled, stands 22 1/2 inches, and has a correct moderate coat of medium gold. He has a gorgeous, masculine head with a friendly expression. He has full dentition, lovely dark pigment, and a dark eye. Manny also has lovely angles front and rear, and epitomizes the balanced, moderate Golden. In the field, he is a birdy, confident boy. He is intelligent, learning concepts quickly, and is a team player. He has an excellent memory. 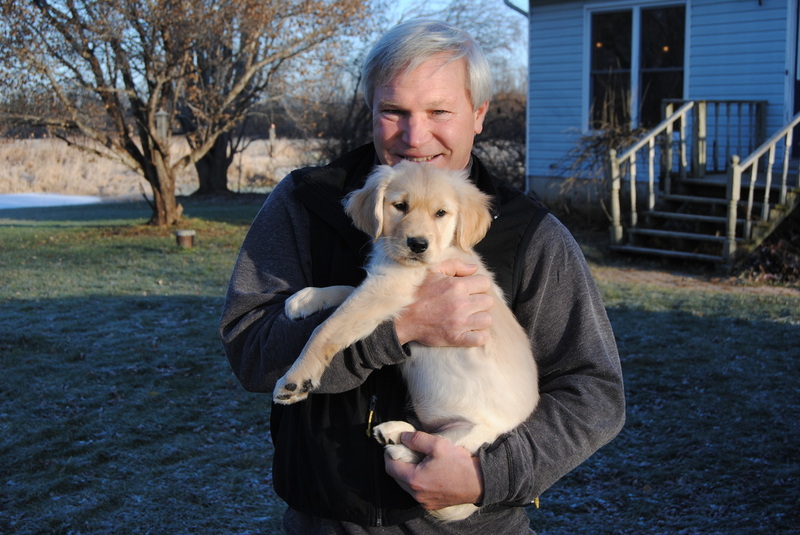 His accomplishments to date include a Master Hunter and a UKC Hunting Retriever Champion, and he has been awarded a 4th and a Reserve Jam in Qualifying. In the obedience ring, he is a precise, upbeat worker who went HIT with a score of 199 on his first Novice leg. His next 2 legs were also in the ribbons, with a second place and a first place respectively, going 3 for 3 to title with his CD. He was also 3 for 3 in Open all with placements. He is working on his UD and may try his hand at tracking. He has been completely owner trained and handled through all training in field and obedience. Recent accomplishments include being awarded the Bill Lester Trophy at the 2013 GRCA National Specialty. This trophy is awarded to the GRCA member accumulating the highest points in AKC licensed or member breed shows and AKC licensed field trials during the calendar year. He also placed first in the Field Trial Dog class and first in the **Gun Dog Sweeps. Manny gets along with all dogs, is great with kids, and is a playful affectionate boy who loves everyone. He is a wonderful house dog. Although still young, Manny has produced some lovely puppies who have inherited their sire’s great looks and working ability. Bonny is a high drive, biddable, focused girl who loves to work! In the field, she is an excellent marker who loves her birds. She is calm and steady on the line but is a fast, hard running girl once released, with a spectacular water entry. She easily earned her GRCA and CKC Working Certificate titles and her AKC JH and then went straight to Master, earning three AKC MH passes in her first season out. She is a spectacular obedience dog – an exciting combination of flash and precision. In just 6 trial weekends, she went from CD to MOTCh, earning HITS every weekend that she showed. She is making great progress on her GMOTCh, with 6 legs so far and multiple HITs from both Open and Utility. She often ties herself, most recently earning scores of 199.5 from both classes. In 2013 alone, she earned her CD CDX UD/OTCh OTCHX MOTCh GRCC VCI VCX VHOF OHOF and her AKC CD. To date, she has earned over 15 HITs. Titles aside, she’s a delightful dog to own and train – always game for any activity going - with a great sense of humour and a playful, engaging attitude. She has a joyful demeanour and can make a game of pretty much anything. This is a dog that loves life! She’s an easy dog to live with and has a wonderful on/off switch – perfectly happy to go from running 250 yard marks to snuggling on the couch. She is a strong, athletic girl but also extremely feminine with lovely, floating movement. She quickly finished her CKC CH with a BOB win from the classes. She stands 22 inches and weighs a muscular 60 pounds. She has a lovely body, pleasing head, and good eye colour. Her tail set and carriage are correct and she has a solid, level topline. She carries ample correct coat that resists matting and burrs and dries very quickly. 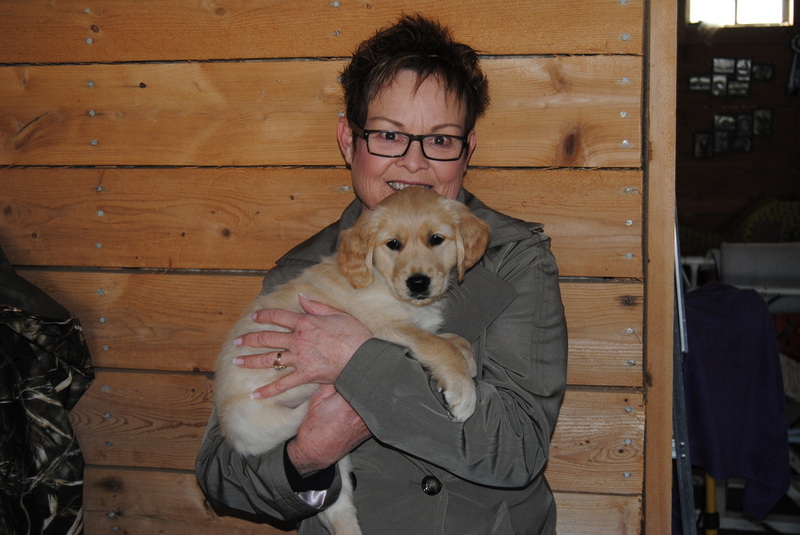 All ten of Bonny’s littermates have had their health clearances done. Nine have normal hips per OFA, with 1 being rated Excellent, 8 Good, 1 Fair, and 1 moderate dysplasia in one hip. All 11 have had their elbows xrayed, and all are normal. All had their eyes and hearts checked and all cleared both; two have tiny juvenile cataracts.